While pot racks offer the perfect storage solution for your pots and pans, they add a charming element to your kitchen as well. Today, we’re featuring whimsical wrought iron pot racks from master blacksmith workshops such as Stone County Iron Works and Enclume. 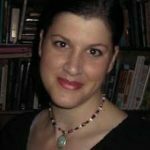 Take a look at their intriguing designs below. This hand forged beauty from Stone County Iron Works boasts natural elements of twigs and leaves. It looks lovely as pictured here in natural black, but also comes in a range of finishes to match any décor. 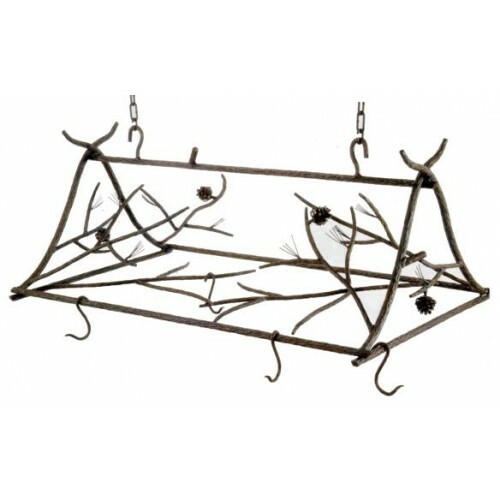 From the skilled artisans at Stone County Iron Works, the Gourmet Pot Rack’s design is a gentle blend of natural elements and elegant curves. It also comes in different finishes, so we’re sure you’ll find something to suit your kitchen décor. 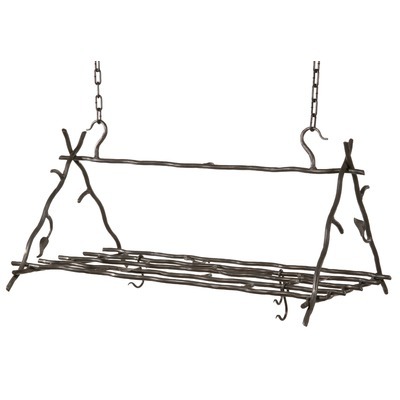 The Rustic Pine Pot Rack is indeed rustic with its natural elements of branches and pine cones. It would make a charming addition to a cabin or lodge décor as well as a country one. 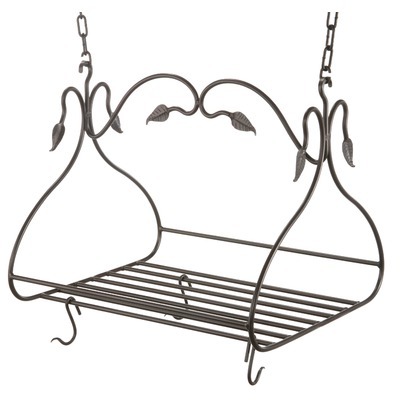 Created by Stone County Iron Works, it’s also available in a wide array of finishes. 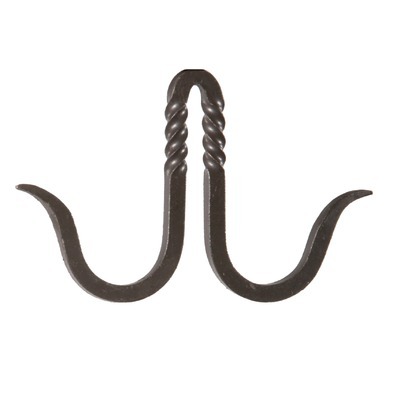 With its classic scrolls and oval shape, the Décor Oval Rack by Enclume is as stylish as it is durable and lightweight. 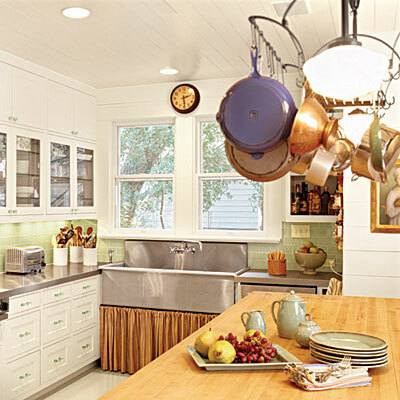 It would be right at home in a romantic style kitchen such as French provincial and country cottage. If want more storage space without sacrificing style, the Large Basket Rack by Enclume gives you both in ample amounts. 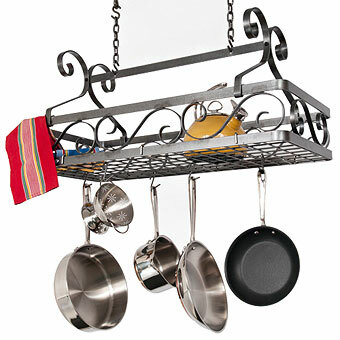 It features a large basket accented with classic scrolls and a grid base for easily hanging pots and pans. It comes in a hammered steel finish which will fit with many other materials in your kitchen. 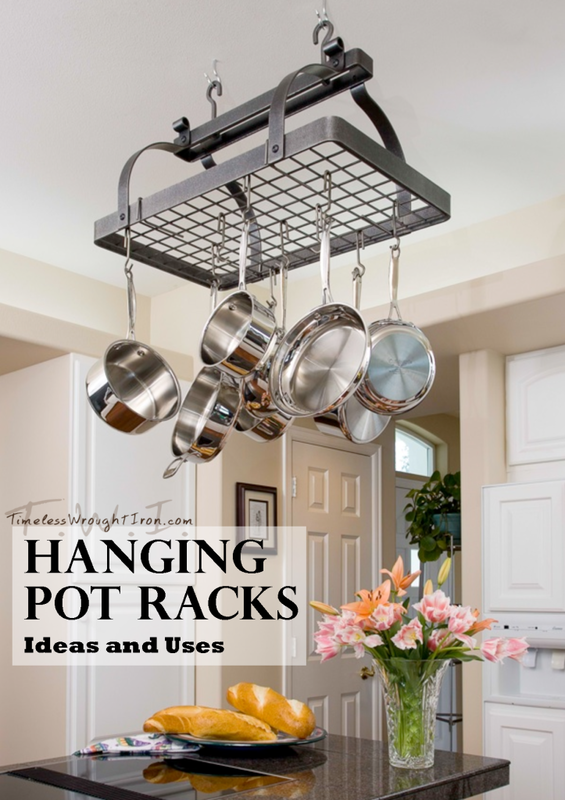 We offer additional pot rack hardware including hooks, hangers, chain and mounts for your new or existing pot rack on TimelessWroughtIron.com. Never be in doubt when buying and installing your wrought iron pot rack. 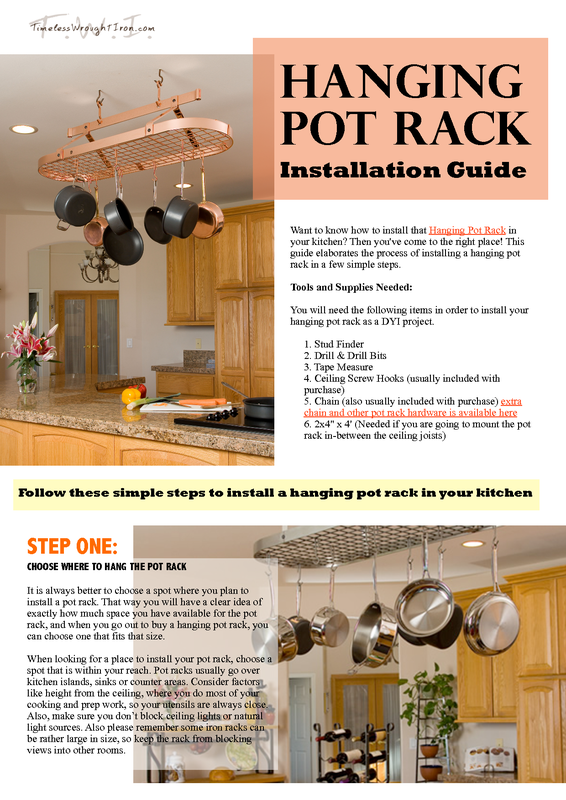 Our handy and easy to follow guides give you every thing you need to ultimately start enjoying your new pot rack. 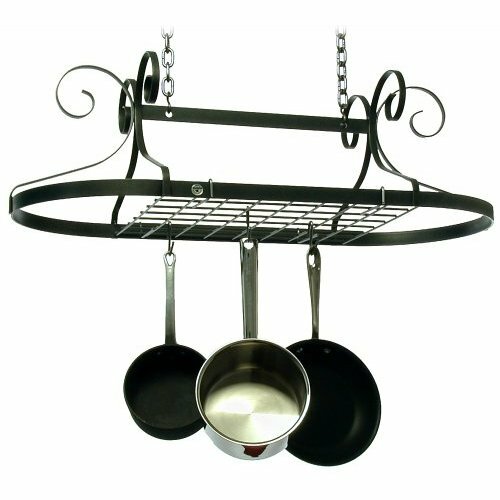 Use gravity to your advantage with a sensible and stylish wrought iron hanging pot rack. It’s a functional way to clear up some cabinet space while keeping all your utensils within arms reach. We offer lots of terrific pot rack use ideas as well as info to help you choose your ideal pot rack. Installing a Hanging Pot Rack is easier than you think, all you need is a little direction and the right tools with our comprehensive guide your pot rack will be hanging in no time.